Communication is important from concept through production when it comes to making clothing. After all, me calling up my production manager and saying, "Hey, can you make me a top that's short, but not too short, but still kind of short..." isn't really helpful (and it'll probably result in him flipping a table and writing nasty things about me in his diary). While sketches aren't perfect, they're the best way for me to get my ideas from vague notions floating around to something concrete we can build a business on. And for Kestan, every collection begins with a sketch. First things first, there really is no "correct" way to draw. At the heart of the matter, sketching is really just a tangible form of expression. This post will outline a bit of my personal process, and the tools I use on a day to day basis. Note that I wouldn't consider my work fashion illustration, rather they're a way to map out clothing in a clear and practical way for those I work with. Let's get to it! the tools | While designing, I'll pump out tons and tons of ideas. That means my methods need to be quick, efficient, and clear. Since I usually don't have time to fully illustrate looks, I work mainly with marker and pencil. - Micron : My favorite go-to pen for fine lines and detail work. I use 005, 05, and 01 the most often in black. Their nibs are fine, and can get bent if you're too rough though, and you'll find that they run out of ink quickly. I still prefer them because of the intense and clear line work that is achieved. - Staedtler Lumocolor : Another pen I like to use. The line is thicker, and these pens are refillable. Note that they're non-permanent, so keep away from your coffee cup! 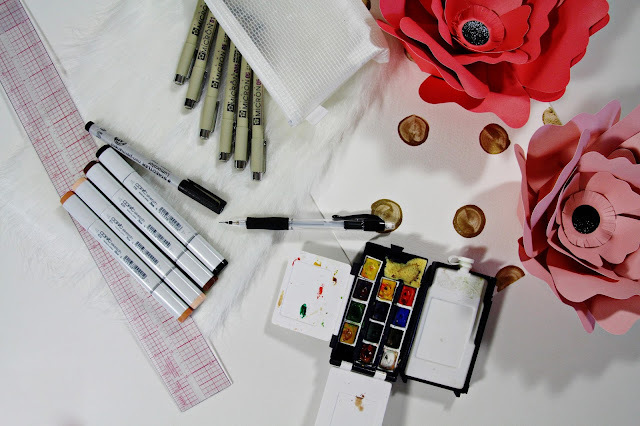 - Copic Sketch Markers : I use the double ended pens with a chisel point and brush point. While sketching, I primarily use the brush point to blend colors easily. E25 for hair, E13 & E11 for skin tone, and 110 black. Four markers and we've got a season of sketches. the process | I always begin by sketching figures. That way it's easier to envision how looks go together, and how the line will look merchandised. These figures are looser and meant more for illustrating a feeling or idea. I also hardly fill in actual face and hair details, but that's a matter of personal preference. 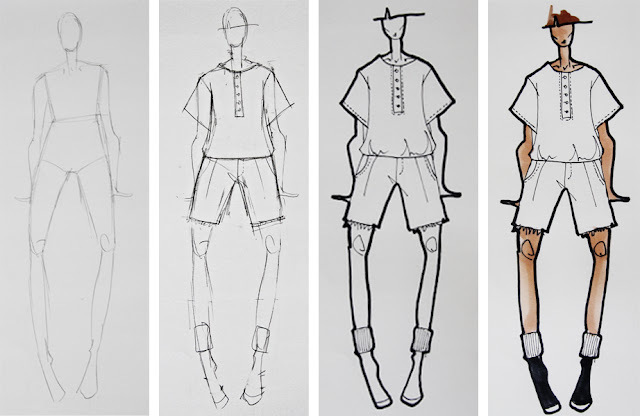 A croquis is a base body template that people sketch on top of. While starting off, you can search for numerous free options online. I've been sketching for a while, so I always quickly draw of my own figure first. This helps me with proportion, and is in my own "style". 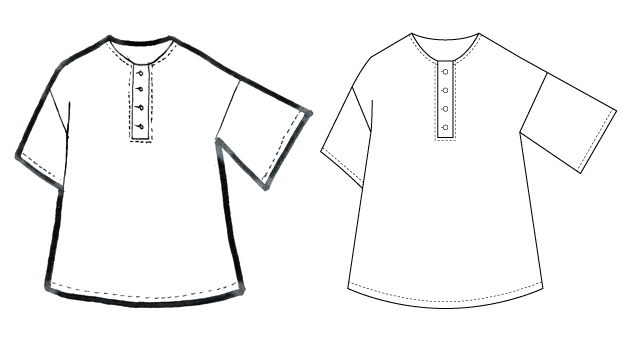 After I get my form, I'll draw the garments on top, quickly outline in black, and fill in the body. If necessary, I'll watercolor color on top. For me personally, it's most important to just get the garment right, as colors are chosen later while sourcing fabrics. Also, as Kestan is silhouette and trim oriented, I prefer to work in black and white so I can see how the collection comes together by shape. Flats - After sketches are done and I've finished editing the line with my team, I'll go back and do flats. Flats are a technical drawing that is truly used as a "map" for pattern makers and production to figure out what makes the garment. You'll find a very basic example I've done by hand, and on the computer in Adobe Illustrator. I personally always have one sleeve down, and the right sleeve open or folded. There will always be a back and front view, and sometimes side if you're feeling ambitious and detail oriented. Whether you work by hand or on the computer can vary depending on where you work and/or your personal preference. Flats are important because they're no frills - just straight information. Through the flat you can convey important information. How many buttons are there? What type of stitching are you using? What's the hem? What type of sleeve are you doing, and what's your silhouette? And that's my sketching / flat process. The most important thing that I can stress is that at the end of the day it's all personal. The best method is whichever way allows you to express yourself comfortably and clearly. If you're one of my old drawing professors and reading this, please don't groan at my lack of a perfect croquis, or that I'm not sitting at my desk mixing colors by hand all day. I'd much rather spend my extra time baking cookies (and eating them too)!